In addition to being a practical and effective way to promote your message, lawn signs have a lot of curbside appeal. Designed to maximize your budget, lawn signs can be printed in full color for a fraction of the cost of other options. 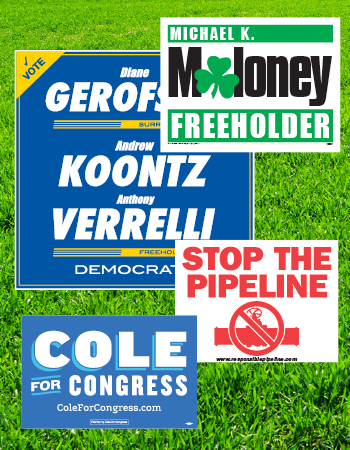 Examples of our work show up beyond Mercer County NJ and Bucks County PA.
Trenton Printing can take care of all your lawn sign printing needs. A few types of lawn signs that even lawn gnomes enjoy staring at include: Birthday Lawn Signs, Campaign Lawn Signs, Directional Signs, Garage Sale Lawn Signs, Political Lawn Signs, Real Estate Lawn Signs, Yard Sale Signs and more! Looking for something similar to a lawn sign that you can take with you on the go? Check out our banners page. We can create custom banners for every kind of special occasion. If you need something more permanent, we are your source for custom sign printing in Trenton NJ. Contact us to discuss your sign project today.